When plans for a career as a professional golfer were derailed by injury, country singer/songwriter Jake Owen picked up a guitar and never looked back. A native of Vero Beach, FL, Jake and his fraternal twin, Jarrod, grew up in the Florida sun playing sports like baseball and football before Jake turned to golf and Jarrod to tennis. They continued their respective sports together as students at Florida State University, until a waterskiing accident resulted in reconstructive surgery for Jake. Off the golf team and depressed, he borrowed a neighbor’s guitar and passed time teaching himself to play by listening to childhood smashes like Waylon Jennings, Merle Haggard, Vern Gosdin, and Keith Whitley. Ambitious but inexperienced, with good looks and a smooth baritone, Jake could next be found playing country covers in campus bars for free beer and a few bucks. Soon growing tired of covers, he started penning his own music that were met with positive response. This motivated Jake even more to follow his new dream of becoming a singer, eventually causing him to skip out on his remaining college classes — only nine credit hours remained on his English and political science degree — and head to Nashville. He constantly wrote music in his Bellevue apartment, and a chance lunch meeting had producer Jimmy Ritchey (Clay Walker, Mark Chesnutt) befriending the young musician. For over a year, the two wrote songs together, including a track called “Ghost” (also co-written by Chuck Jones) that Kenny Chesney almost wound up recording — the track would later be included on Jake’s own album. Eventually, his friendship with Ritchey led to a meeting with Sony/BMG Nashville and resulted in a album signed deal for the determined 24-year-old, who already had his album basically finished. His debut, Startin’ with Me, appeared in summer 2006 on RCA, spearheaded by the single “Yee Haw.” As the song climbed higher in the charts, Jake supported the album on the road opening for Kenny Chesney. In 2007, the title track ballad became the album’s second single, reaching number six and spending a whopping 35-plus weeks on the Billboard country charts. “Don’t Think I Can’t Love You” appeared in the summer of 2008, heralding the release of his second full-length, Easy Does It, in February of 2009. The Owen’s Welcome First Child. Jake Owen and his wife, Lacey, are extra thankful this Thanksgiving! The two happily welcomed baby girl, Olive Pearl Owen, to this world this past Thursday. The two married in May 2012 and first met on the set of Owen’s music video for “Eight Second Ride.” Owen tweeted: “Today is the greatest day of my life. Welcome Olive Pearl Owen. 6lbs 3 oz Turkey Baby!!! Happy Thanksgiving” Congratulations to the couple and all of their family and friends! Jake Owen Sells Out Two Texas Shows! Jake Owen is unstoppable right now, and Texas fans are definitely showing their love. Jake performed to two sold out shows in San Antonio and Fort Worth. But these aren’t Jake’s only sold-out shows. He broke the CMT On Tour record for most consecutive sold-out shows! His platinum-certified hit song“Barefoot Blue Jean Night”was named ASCAP Country Music Song of the Year. He was also a presenter for the 46th Annual CMA Awards, and his latest single,“The One That Got Away,” is continuing to climb the charts. You can catch Jake on tour with Jason Aldean‘s 2013 Night Train Tour next year! 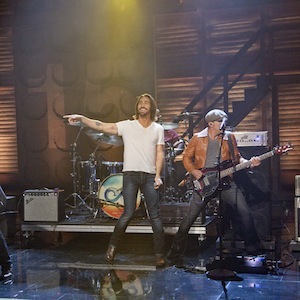 Jake Owen Sets Ticket Record with CMT On Tour: The Summer Never Ends 2012. The summer definitely isn’t over for the country music fans who helped Jake Owen set a record with his current CMT On Tour Jake Owen: The Summer Never Ends 2012. With the tour just recently kicking off, Owen has already set the record for the most consecutive sold out shows for the annual CMT Tour, which has featured the likes of Jason Aldean, Miranda Lambert, Keith Urban, Brad Paisley and more, since its debut eleven years! The debut dates in New York, NY and Detroit, MI completely sold out and his upcoming dates in Charlotte, NC, Chicago, IL, Des Moines, IA, Minneapolis, MN, MIlwaukee, WI and St. Louis, MO are prime for advanced sell-out! Since we’re pretty big Jake fans here at CMNB, we can’t really say we’re surprised! The tour will wraps up in Jake’s hometown of Vero Beach, FL on December 15. Jake Owen Lets Fans Behind the Scenes On Endless Summer via CMT! Fans of Jake Owen can get a behind the scenes look at his recently released Endless Summer EP this week! Owen will be featured on a 30-min special on CMT on Tuesday, October 9th at 9:30am ET/PT! You can follow along while viewing on Twitter using the #CMTonTour and tweet directly to us with #CountryMusic to @CountryMusicNB. Tweet you there! Don’t Forget Jake kicks off the 11th annual CMT On Tour on Wednesday, October 10 in New York City, with special guests Love and Theft and Florida Georgia Line. Ticket info below! Jake Owen Will Be Releasing A New EP! Jake Owen will be releasing Endless Summer, his upcoming 4-track EP on September 25. “It’s been almost a year since our album, Barefoot Blue Jean Night, came out. And, I started thinking that I really wanted to put out a few new tunes that had a summer vibe. So, we decided to cut four songs and put out an EP entitled Endless Summer. No one ever really wants the summer to end, right? Hopefully, these songs will be ones that keep the party going into the fall and people will crank them up loud when they are out on the water enjoying their own Endless Summer.” -Owen Jake unofficially announced that he was recording a four-song EP at his Fan Club party during CMA Music Fest. At the party, he let his fans hear a sneak peek of the EP by playing them one song that he had already recorded entitled “Summer Jam,” which was written by the duo Florida Georgia Line along with award-winning songwriter Craig Wiseman. Also, Jake earns his first executive producer credit on this EP. Joey Moi, who produced Jake’s No. 1 hit singles “Barefoot Blue Jean Night” and “Alone With You,” as well as his current single “The One That Got Away,” is the producer on all four tracks. Below is the artwork for the EP and a video that features Jake talking about the new project! Enjoy! Jake Owen And Lacey Buchanan Are Expecting A Child! Jake Owen and new wife Lacey are expecting their first child! Owen proposed to the 22-year-old, long-time girlfriend on stage in April and a month later they were married. They are quick to say this isn’t a shotgun wedding by any means! Owen told People magazine that he had already asked Lacey’s father for her hand when they found out she was pregnant. “The way we saw it, the baby news was a bonus on top of the engagement but we didn’t want anyone to think we were getting married because Lacey was pregnant, and we wanted to celebrate our wedding first.” -Owen to People Congrats to both of them and their families! Babies are a blessing and we wish Lacey a healthy and happy pregnancy!